This chart was generated on Oct 31, 2006 (Halloween day in the US). As usual, you may hover over the bubble chart to get data on each ETF and click on a bubble to get a Yahoo! Finance chart for it. This is done by taking the geometric mean of the 3 valuation metrics for each ETF (which is already a cap-weighted mean of each ETFs components). Considering how important are Book-values and Cash-flow for potential acquirers of a business, and considering how PEs can be manipulated and distorted by one-time events and other accounting tricks, we view the combined 'value' metric as a much better representation of real value than just the PE. As a result of the sharp summer correction (May 9, to July 2006), the chart shows many red bubbles. These red bubbles are ETFs which were hit hard in the correction, and are now showing negative returns for the past 6 month period. Some of these may present a buying opportunity despite the impressive rebound since the July bottom. Most red circles lie on the right side of the chart. This is a clear visual evidence that the fastest growers which went up the most are usually the most vulnerable whenever a correction comes. What goes up sharply, comes down sharply. The further we go to the right and upwards, and the further we go from the main diagonal towards the outer parts of the bubble cloud, the bigger and less crowded the bubbles are (both red and blue). This divergence is due to the fact that the less "normal" (or average) the asset is, the harder it is to accurately estimate its "true" value. The biggest earnings surprises (when stocks go up sharply) and disappointments (when they fall sharply) come from the fastest growing (far right), or most overvalued (upper extreme) companies. Excess volatility also comes from oddballs, narrow sectors, unusually distressed, or overly leveraged (with debt) companies. The recent correction brought with it what looks like a structural shift in US markets: for the first time in 4-5 years, large-caps now seem to be outperforming small-caps. This can be because the sharp correction affected small caps more. It remains to be seen whether this new trend persists. The best values are on the lower and lower-right side of the chart. If you're looking for safety and less volatility, you should be preferring whatever is the lowest (best combined value) in the chart and focus on the left (slow growers) side. If you're willing to take more risk you can pick some bargains from the lower-right (faster growers) quadrant. 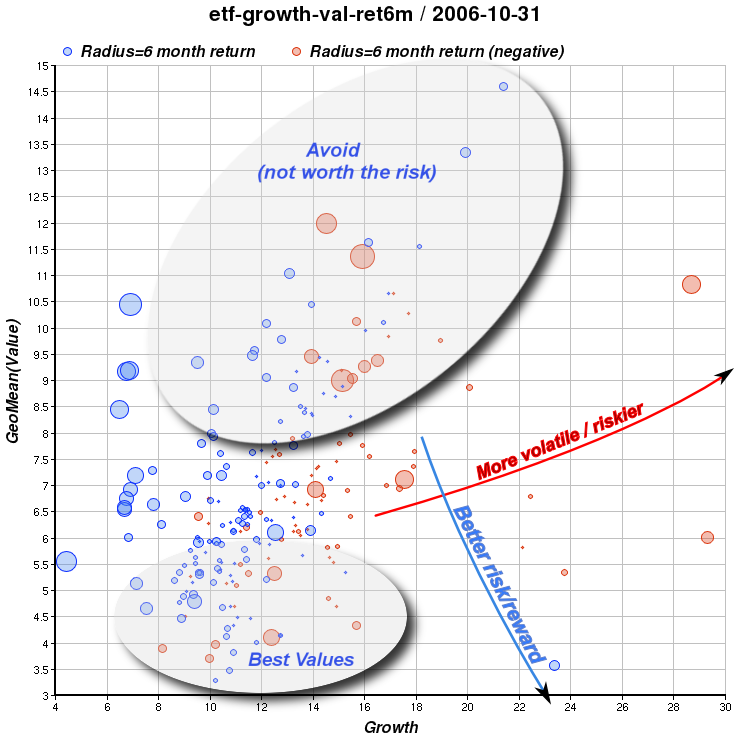 You should diversify by picking both but give a lower weight (buy less) to the more volatile, fast grower ETFs since long term returns are inversely related to too much volatility. I have annotated the chart accordingly. After more than a decade of low interest rates and a significant housing bubble in the US, the home builders (XHB) have had a significant correction. On the other hand, the REIT ETFs (Real Estate Investment Trusts): CEF, IYR, RYR, VNQ, are now the biggest bubbles (with very strong 6m-returns) as can be seen on the middle-left side of the chart. It appears that REITs are still running strong because businesses and corporations are doing so well in the US, and these REITs are mostly invested in prime commercial real-estate. A recent BusinessWeek issue notes that the US REITs are at the lower end of their historical dividend-yield range which is a cause for caution. I would be careful and gradually underweight REITs at this point (and say thank you! for a great long run). The best pure value right now is IXG: Global Financials. The fact that these are global is a partial hedge against the continuing weakness of the US dollar. Prefer IXG over IYG. Other sectors providing opportunity are HHH (Internet HOLDrs) and IIH (Internet infrastructure), both of which continue to show improving balance sheets and cash flows despite hitting 6 multi-month lows. More values can be found in some country ETFs, especially those of Brazil (EWZ), South Korea (EWY) and Taiwan (EWT). You should underweight stock vs bond for a more conservative mix. Note, buying too much in small quantities increases costs/commission ratios. If you have less than $100,000 to invest, I wouldn't split it into so many components. Instead, I would get rid of all the small opportunistic ETFs, and merge some categories, e.g. for US stock you may pick 'VTV' (Vanguard Value) replacing the first 3 rows. For developed country stock, pick only one: either EFV or ADRD. Merge the dividend emphasis and the bonds into one category (buy only one of them). Perhaps the biggest weakness of this portfolio is that its top weighted core assets are a bit too correlated. Unfortunately, in the global economy all stock markets seem to be linked stronger than ever. Some would argue that it might make sense to overweight the low-correlation assets like energy/commodities/natural-resources (which are at the bottom) to the mix for a more 'rounded' portfolio. In that group, IGE looks the more diversified (not just energy) but is not low enough on the combined-value and/or growth/value scale. IGE ranks about 50 out of 300 ETFs (top quintile, i.e. better than 80% of the ETFs) on both metrics. The more 'valuable' options like IEO/PXJ, which fall in the top decile (better than 90% of the ETFs), but the downside there is that they are very volatile. The problem is that non-correlated assets are few and far between and I don't want to put more than about 10% in the volatile energy/commodity basket or even in any narrow sector even if it looks relatively safe right now (like IXG). Some people ask how I collect the data, analyze it, and generate these interactive charts. The short answer is mostly with free-software. Kubuntu Linux, perl, inkscape, gimp and a very cool, inexpensive (but not open-source) chart library called Chart-Director.